The Detroit Film Theatre and the Redford Theatre recently celebrated the coming of spring with the two most significant feature films released by the Walt Disney studio during its founder’s lifetime. 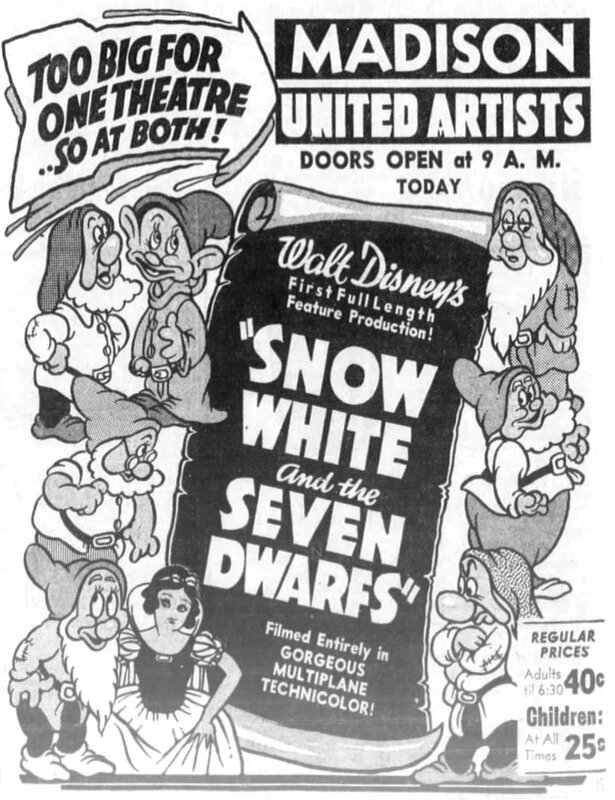 On Saturday, April 15, 2017, the DFT presented the 1937 animated feature Snow White and the Seven Dwarfs. 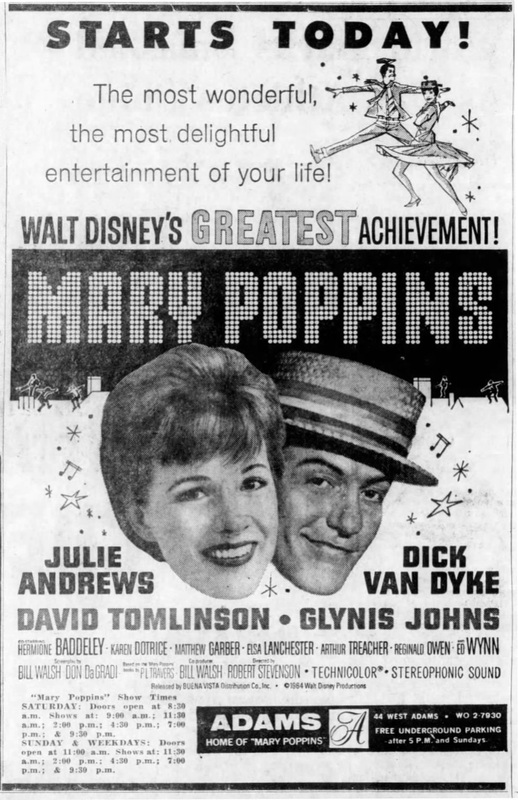 A week later, on April 21 and 22, the Redford screened the 1964 fantasy Mary Poppins, which was released two years before the death of Walt Disney. Snow White was shown at the DFT as part of its ongoing DFT Animation Club, which this year has included Tim Burton’s James and the Giant Peach and the Japanese Ocean Waves. Before Snow White, DFT founder Elliot Wilhelm talked about the tremendous three-year effort to create what would be the first full length animated film. [Walt Disney] didn’t realize when he first started the project…how much work it would be, how many new kinds of technology they would have to invent. They used to draw animated figures for cartoons on pretty small pieces of paper. They were about twelve inches wide. And when they started doing this film the detail had to be such—in fact there are many scenes in which all seven dwarfs appear, you have to see their personalities and faces, see them doing all kinds of things. A single twelve inch wide piece of paper wouldn’t do it, so they had to develop newer, bigger ways to design these characters, all kinds of new camera techniques to make things look realistic. It took a long time, a great deal of work. Every day they all had to talk about the story, how the story was coming along, the changes that needed to be made. The animation was so expensive that they couldn’t really shoot any extra. They had to know exactly what they were going to turn their film into every day and they made it all drawn by hand. There were no computers in the 1930s. In Snow White, I was impressed by the detail and somber depth of the background images. They reminded me so strongly of Dutch paintings that afterwards I walked over to the Detroit Institute of Arts and visited the Dutch art gallery. I saw Mary Poppins at the Redford on the afternoon of Saturday, April 22. Before the movie started, organist John Lauter warmed up the crowd with a lively medley of the songs from Mary Poppins. When he played “Supercalifragilisticexpialidocious,” a spontaneous round of rhythmic clapping filled the auditorium. During intermission, John stayed with the Disney theme with a medley of songs from Snow White, taking me back to the DFT screening of that movie. After John finished, a Mary Poppins look-alike helped with the 50-50 raffle. Mary Poppins played most recently at the Redford in 2009 (Two Visits By Mary Poppins) and 2013 (Welcome Back, Redford). Every time I’ve seen it there, I’ve always felt sorry for the parents of young children towards the end of this two hour and twenty minute movie. The momentum-deadening scenes in the bank provoke a lot of restlessness. But the transcendent wonder of the closing “Let’s Go Fly a Kite” scene leaves a final happy impression, making for many smiling faces as the auditorium lights go up. I tried to watch Snow White and Mary Poppins through both my adult eyes and through the eyes of the many children who were in attendance. As someone who has worked on many professional work projects, I appreciated the ambition, innovation, and vision of each film. During both screenings, I occasionally looked around and tried to imagine the impression being made on young children as they watched the movies. For them, animated movies have become so numerous and routine that they probably consume them more than they watch them. But maybe they were seeing Mary Poppins or Snow White on the big screen for the first time, and were seeing familiar details in a new way. Maybe they were touched by the energetic enthusiasm and creativity that make these two magical movies worth watching decades after they were first released. This entry was posted in Detroit Film Theatre, Redford Theatre. Bookmark the permalink.